Honour Ice Cream have a history page with content on how the first soft ice cream vans were introduced to West Philadelphia in America. Two Irish brothers by the name of William Conway and James Conway set out to the Streets of Philadelphia on St Patrick’s Day and gave out free green ice cream to all their customers, the Company’s name was Mister Softee . “Direct Drive System” for Ice Cream Vans. The invention of the fist ” Direct Drive System” to power the soft ice cream machine inside an ice cream van was invented in the United Kingdom by Bryan Whitby. 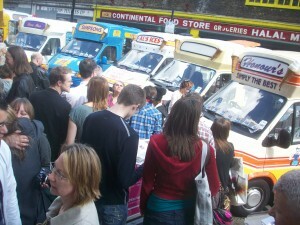 Honours Ice Cream and other vendors take part in The Ice Cream Orchestra in London on Sunday the 26th of April 2009, six ice cream vans were hired to take part. This entry was posted in General and tagged Honours Ice Cream History Page on December 27, 2011 by Onur.